Choosing the right dentist for your and your family’s needs just became much simpler. In Sacramento, CA, Dr. Klim and his staff at My Dentist, are the ideal choice for dental care from childhood to the mature adult years. 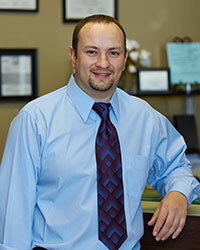 Dr. Alex Klim began his dental career with a Bachelor’s of Science from UC Davis. He continued his education at the University of the Pacific Arthur A. Dugoni School of Dentistry in San Francisco. He earned his DDS from that institution in 2006. Since beginning his dental practice at the My Dentist location, Dr. Klim has bought the practice, and spent his time building his clientele, updating the technologies of the office, and serving his patients with a focus on individual need. Dr. Klim feels strongly about his patients and their comfort and makes it a priority to spend extra time with each patient during appointments. He takes this time to educate on the patient’s condition and carefully explain his recommended treatment plan, reducing stress and creating a relationship both doctor and patient are comfortable in. From routine cleanings and checkups, to more serious dental treatment procedures, Dr. Klim is dedicated to the overall health of each of his patients. Schedule an appointment to learn more about him, his practice, and how he can help you establish and maintain dental health.